If I were king, dilly dilly, I'd need a queen. Congratulations must go to Virginia McNaughton for she must be the queen of Lavender. 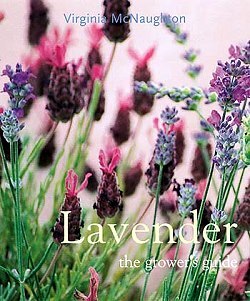 What an incredible book she has provided for all lavender enthusiasts. Photo after photo and description after description both tickles and satisfies our curiosity. So many questions are answered in this book, that each time it is reread there is another bit of enlightening information that makes you go' ah ha! now I get it'. A botanist, Ms. McNaughton has provided us with specific detailed descriptions of the plant's origins, the proper botanical nomenclature, the color of the flowers AND the foliage, and special pruning and growing requirements. She has broken the groups of lavenders up into sections and listed the specifics for that group, for example the Lavandula angustifolias, as well as, the multitude of named varieties that belong to that group. Also of great help are the other common names a plant may be called. For instance, Dilly, Dilly is a common name of Lavandula x intermedia Grosso. The only draw back to this book is that when you are finished reading it you just have to have all the lavenders she describes. So many lavenders so little time.